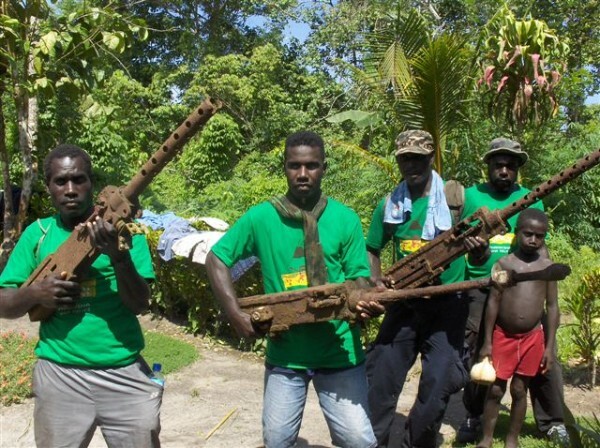 U.S. Department of State heading for peace in Bougainville! When the Bougainville Crises came to an end ten years ago, disarmament and weapon destruction became a major issue of Bougainville politics. Without law and order no economic development will be possible, without enduring peace the wish of independence will remain a dream - forever. 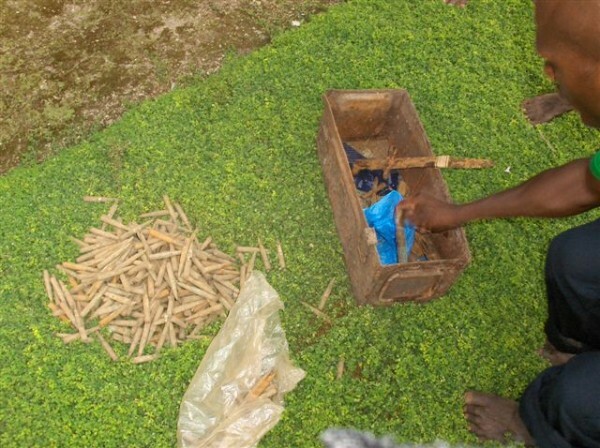 Since 2010 Bougainvilleans get support from the United States of America to get rid of old World War II weapons left behind by soldiers from different countries. It was in the 60ies of the 20th century when Conzinc Riotinto of Australia (CRA), the predecessor of Bougainville Copper Limited landed on Bougainville, first for exploration and later for mining in the Panguna area. They found a people traumatized by crucial battles that happened twenty years before: The Second World War that opposed the United States of America’s army to Japanese troops on the remote island of Bougainville. Until this time Bougainville had been a more or less forgotten tropical island in the Melanesian part of the Pacific Ocean. That war brought never seen destruction and brutality to that part of the world. 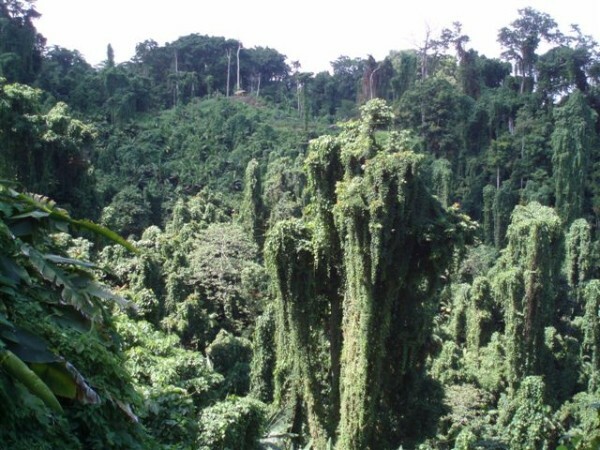 Bougainville and his peoples lost – once for ever – their virginity. Nearly 50 years later, the Panguna mine had opened and already contributed an enormous amount of money to the newly founded state of Papua New Guinea (PNG), unrest rose up. 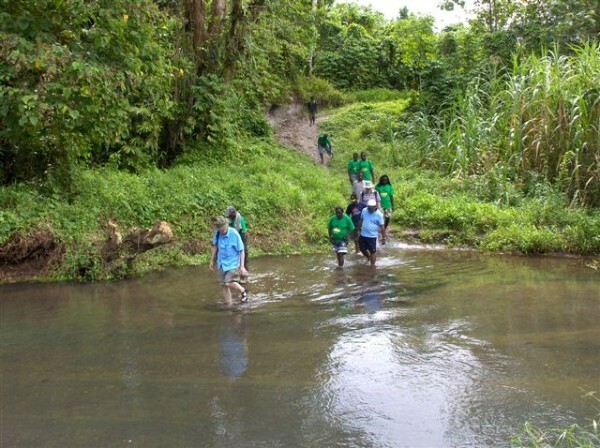 Although BCL had brought new infrastructure in roads, schools and excellent health service to the island the indigenous people of Bougainville started to revolt against Bougainville Copper Limited (BCL). That was because of unpaid royalties and environmental damage. Today it also seems that the former management of BCL did not listen to the local matters sufficiently. As BCL is owned at approximately 20 percent by the state of Papua New Guinea, since the beginning of mining in Panguna Bougainville Copper was considered as an occupying power from "abroad" - from Papua New Guinea. The old Bougainvillean wish for independence from PNG came up again. Soon first terrorist attacks to BCL installations on the ground were reported. As these attacks increased, BCL decided to abandon the Panguna mine urgently. Once BCL had left the island the Bougainvilleans became even more desperate: The Bougainvilleans continued fighting against each other. 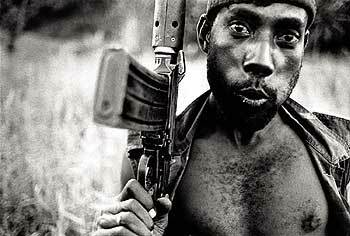 The so called “Bougainville crisis” roused. That was some kind of civil war that caused some reported 1,200 victims by direct battle activities and some 20,000 people more who died by age or because of poor medical treatment due to a lack of medicines. This was because a blockade of the island by PNG. Historic copy of Papua New Guinea's first newspaper "Post-Courier! 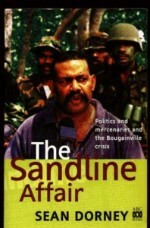 In the so called “Sandline Affair” a group of foreign mercenaries, together with soldiers of the PNG Defence Forces (PNGDF), tried to give a turn-around to the situation. But failed. The rebels who first had attacked the mine area and later the PNGDF were well prepared: Instead of using traditional bows and arrows they were supplied with high quality guns, ammunition and explosives that they had either stolen from the mine area or that they had dug out in the surrounding rain forest where all soldiers who fought in Bougainville had buried a giant number of war weapons at the end of WW2 in the ground. Those - well preserved by grease - are still in use today by some criminal groups on the island who threaten peace loving Bougainvilleans. 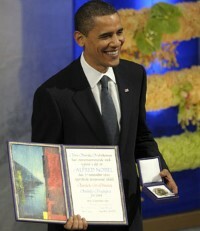 Now, more than 65 years later, Peace Nobel price winner Barack Obama’s Department of State sent a group of experts to the ground of Bougainville to collect and to destroy these old war remnants. Charles A. Stonecipher is the coordinator in Washington D.C. for that “cleaning-up mission”. 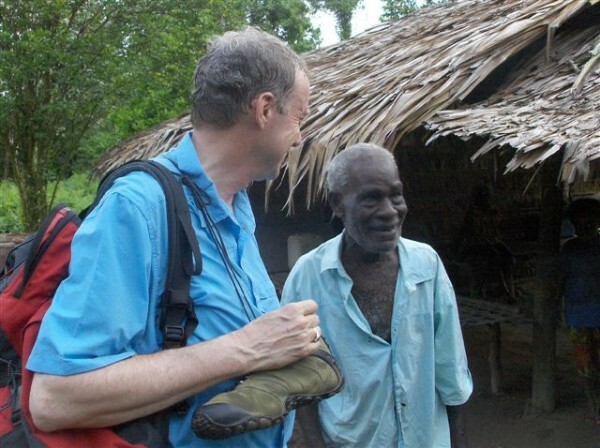 He gave the ESBC this complete report on the U.S. activities on the ground in Bougainville to be published exclusively on the ESBC’s homepage. Mr. Stonecyper pointed out that the operations run under leadership of the U.S. Department of State, headed by Mrs. Hillary Rodham Clinton, and not by the Pentagon as some newspapers falsely reported. Furthermore: He answered to all the ESBC’s questions as well. I am the Washington, DC-based program manager for the U.S. Department of State clearance operation at Torokina district on Bougainville, and U.S. Ambassador to Papua New Guinea Teddy Taylor has asked that I respond to your recent request for information about that project. We welcome your interest, and hopefully I can give you a useful overview of the project and answer your questions. 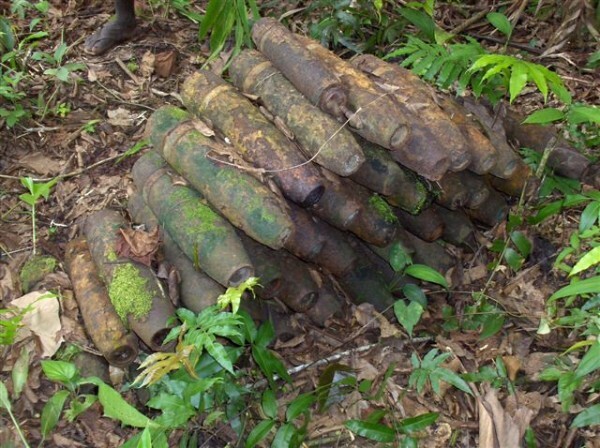 First, despite how the project has been portrayed in some news outlets, it is important to note that it is not a military operation at all, but instead is being entirely funded and conducted by the U.S. Department of State, as part of a global program to reduce the threat of conventional weapons, including landmines and other explosive remnants of war. The Office of Weapons Removal and Abatement manages this program from within the Department of State’s Bureau of Political-Military Affairs (PM/WRA), and over the last decade has conducted projects in over fifty different countries. PM/WRA works very closely with the U.S. Embassy in Port Moresby to plan and manage the operation on Bougainville. and 1946 you can find here ! 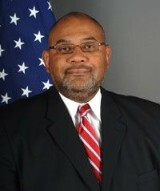 In April 2009 the U.S. Embassy in Port Moresby received a joint request from PNG Prime Minister Somare and AGB President Tanis, seeking U.S. assistance in cleaning up World War II arms and munitions at Torokina, Bougainville. In June 2009 I and several colleagues from the State Department, along with two U.S. military representatives, visited Torokina to make an initial assessment of the situation. 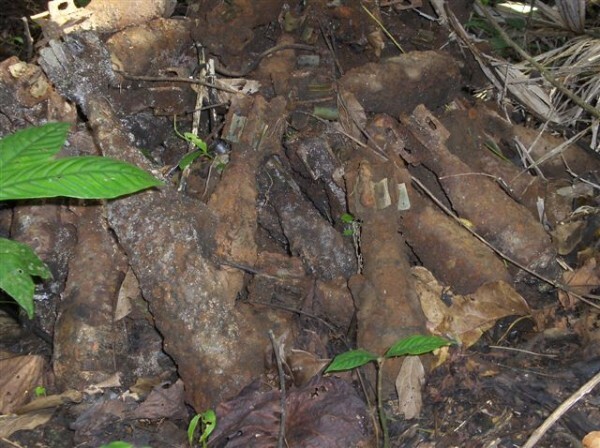 We concluded that there was extensive explosive contamination of the Torokina area, mostly in the form of abandoned mortar and artillery shells, but also including some aerial bombs as well as small arms ammunition. In addition there was unexploded ordnance (UXO) that had been fired but failed to detonate. 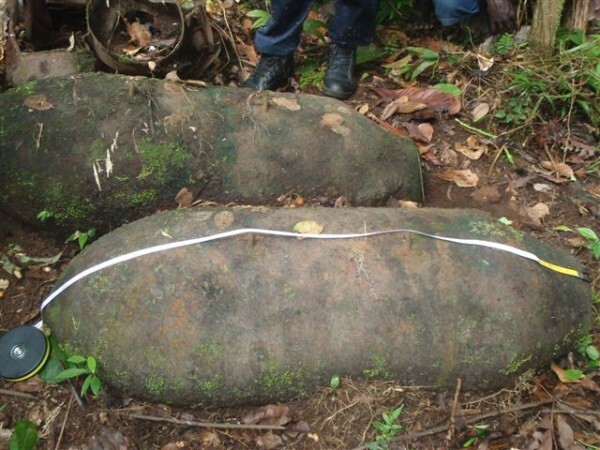 We found that these materials posed an ongoing threat to residents, limited local agricultural expansion, hindered Bougainville’s economic development, and was to some extent still being scavenged to supply arms and munitions to insurgents and criminals. We were shown several examples of rather primitive (though functional) small arms that had been scavenged and put into serviceable condition. We also learned of the role that such arms and ammunition had played during the 1990s conflict. Click on the map and get the larger PDF version! That first visit confirmed that there was good reason to conduct some type of clearance operation at Torokina, in order to address both the humanitarian and the security problems being created by the various munitions. Our next step was to send a small team of civilian explosive ordnance disposal (EOD) experts to Torokina to conduct a more detailed survey and to develop a clearance plan. That group was at Torokina in September-October 2009, and they returned with a detailed map showing 144 sites with surface contamination that warranted clearance. PM/WRA has now sent a seven-man team back to Torokina to stay for three months in order to clear all the surface contamination found during the initial survey, to conduct sub-surface search and clearance of high-priority garden areas, and to train local constabulary officers to identify and report future finds. This team is composed of civilian EOD technicians under contract to PM/WRA. There are no military personnel involved. The team is currently consolidating the known items, and will use explosive charges to destroy them. The efforts I have described above will cost over $1 million, and will only remove the most accessible munitions from the main inhabited areas of Torokina district. As you can imagine, much contamination will remain, especially in more remote areas of the hills surrounding the main basin. By training the local constabulary to identify various weapons types, and to use GPS to record the locations, we intend to establish a system whereby we can consider periodic return missions to Torokina, as local residents find and report additional UXO. We would like to know, if the US personnel will focus only on old bombs or on guns and ammunition as well? The clearance team will focus on destroying the bombs and other munitions we have located, but will also destroy any arms and ammunition that are found or turned in while the team is there. We discussed the possibility of running some sort of arms collection program, but quickly realized that would be beyond the scope of our abilities at this time. How many US personnel are there on the ground? There are seven civilian EOD technicians at Torokina, plus several commercial employees hired to run the team’s camp. The team has also hired numerous local residents to serve as security guards and laborers. on Radio Australia's Pacific Beat! Or read the interview as PDF! 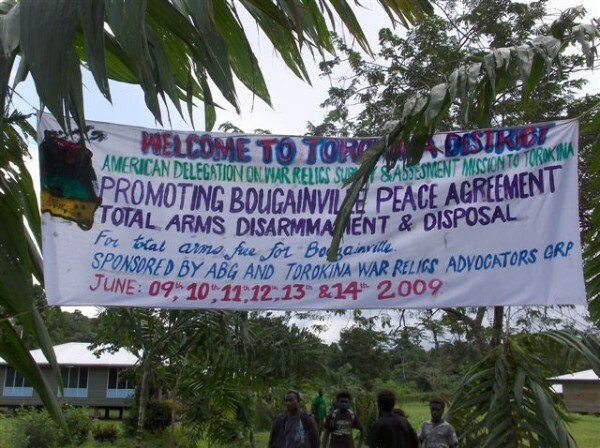 Are the US personnel integrated in the disarmament efforts of the Autonomous Bougainville Government? This mission has been closely coordinated with the ABG, and is considered by the ABG to be an integral part of its larger disarmament and stabilization efforts. Have the US personnel been received in a friendly manner by the locals? During every visit we have made to Torokina, including the current clearance project, the local residents have been extremely warm and welcoming. Is there any local support for the US personnel? Local residents have at various times fed and housed us, most often refusing compensation. Locals have guided us all over the area to show us known contamination, again without charge. During the first two visits a local security firm provided guards at no expense, though we have now hired that same company to provide this service. In short, local support has been excellent. Are the activities focused on Torokina only or on other parts of Bougainville as well? All current U.S. efforts are focused on Torokina. Are the US personnel also involved in collecting remaining arms from locals? We are not attempting to conduct an arms collection program, but we will destroy any arms which we find or which are turned in to us by local residents or by the ABG. 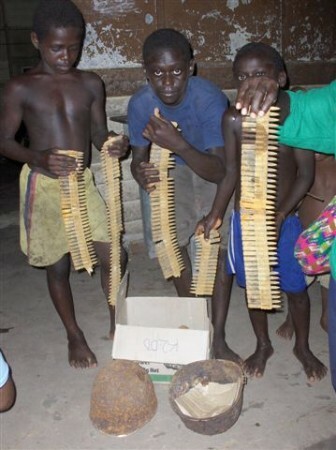 Some local men continue to scavenge for arms and ammunition to sell, but many local residents expressed to us their desire to see that dangerous trade ended. If the ABG were to conduct an arms collection program, we would certainly consider ways to assist that effort. Which orders do the US personnel have in case of being attacked by the remaining so called “freedom fighters” or other doubtful armed folks? In case of any security threat by armed criminals or “rebels,” our team will immediately withdraw. Our personnel are not armed, and are not able to work in a non-permissive environment. Are you confident that the US personnel will be able to destroy most of the remaining WW2 weapons? 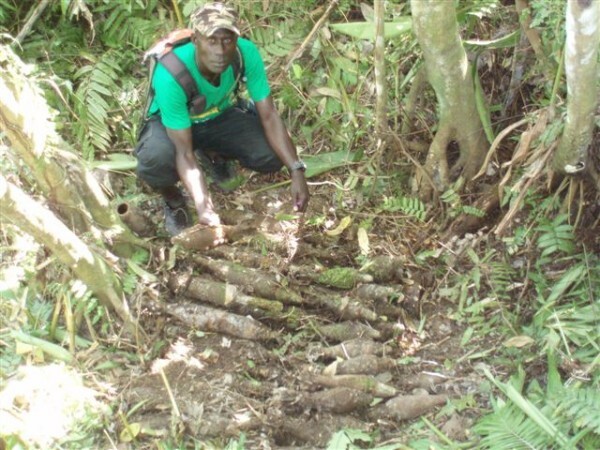 We are confident that the team will succeed in destroying all currently known surface UXO in the main Torokina basin, and that they will also be able to do sub-surface search of garden plot areas to clear them of buried UXO. That said, there will no doubt remain significant amounts of buried UXO elsewhere, and also surface UXO in the surrounding hills. We will never have the financial resources needed to conduct a meter-by-meter sub-surface search of all of that vast area, however, so we will concentrate on clearing the most important areas. Given the level of contamination, we expect that local residents will continue to find new items, and we hope that the reporting system we are arranging will allow those new finds to be safely cleared up from time to time. How long do you expect the US personnel to stay on Bougainville? The clearance team will remain for three months. I hope that this has given you a clear picture of what the United States is doing at Torokina. We aim to reduce dangers to local residents, and help stem the flow of illicit arms, ammunition, and explosives. This project is clearly not a comprehensive solution to all UXO problems at Torokina, but should make a significant contribution, and may well be followed up in future years with other work. 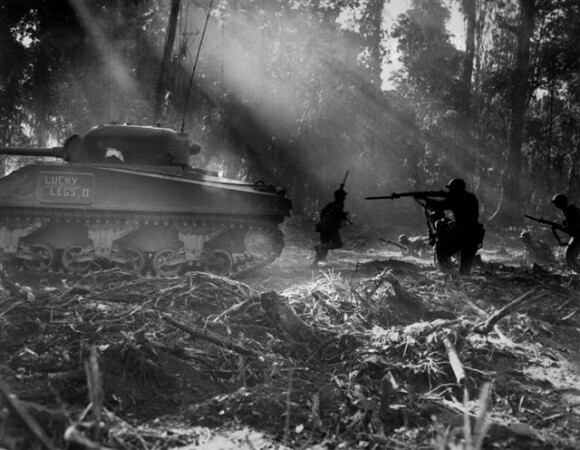 Learn more about WW II on Bougainville. Find also documents, videos or pictures concerning the weapons on the island. approaches Torokina in May 2010.
and heavily forested ridges, often the scene of very heavy fighting during the war. 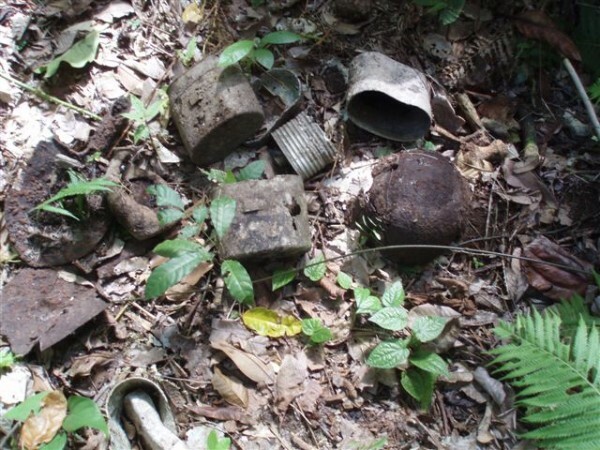 Many piles of mortar and artillery shells are scattered in the forests at Torokina. but can sometimes be too casual in handling potentially unstable items. Some aerial bombs were abandoned near the WW II airfields, and must now be destroyed. to a demolition pit, and which must be destroyed in place.